The 2015 Echo de Lynch Bages has a straightforward bouquet with upfront bilberry and raspberry fruit, a pastille-like purity here with just a hint of vanilla pod. The palate is medium-bodied with fine tannin and well-judged acidity. There is plenty of clean, black, graphite-tinged fruit here although it just dips a little on the finish when I wanted more persistence. Still, this will drink nicely for the next 8 to 10 years. Anticipated maturity: 2018 - 2028. Attractive dark berries with sweet, spicy oak that leads to a slick palate that delivers smooth tannins and a fresh, approachable finish. Try around 2021. A silky and firm wine with pretty fruit and spice character. Full and fine. Second wine of Lynch and makes the grade. The 2015 Echo de Lynch Bages is forward, succulent and quite expressive. A wine that will drink well early, the 2015 captures all of the radiance of the vintage, with good freshness and an appealing, mid-weight personality. The Echo is a quintessential 2015 endowed with lovely depth and tons of near-term appeal. Tasted blind. Some richness. And juice. Real wine with energy and fruit. 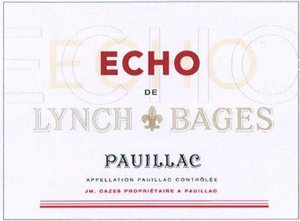 This is the new name, since 2008, for the second wine of Chateau Lynch Bages with a new modern label. It was formerly known as Haut Bages Averous. Maturation is in barrels that have seen one vintage of Lynch Bages. The 2015 blend is 66% Cabernet Sauvignon and 34% Merlot. Bright purple colour with violets and cassis on the nose. The palate is juicy with black cherries and plums. The texture is smooth and fleshy with a white chocolate and red cherry lift on the finish. Plump and smooth, this will provide lots of early drinking pleasure while you wait for the Grand Vin. The nose has mix of black fruits concentration and depth the start of the palate lighter with more of a bramble and bilberry influence. The fruit in the middle is ripe more depth the fleshy richness at the back rather overtaken by tannic firmness. Lynch’s second wine, which accounted for 35% of total production, saw no new oak in 2015.